How many people flock to Broad Street every week, unaware of the vibrant and alternative nights littered amongst Birmingham’s suburbs? Here are 10 places we think you should try that best represent the scope and variety of nightlife in the second city. Round up your pals. 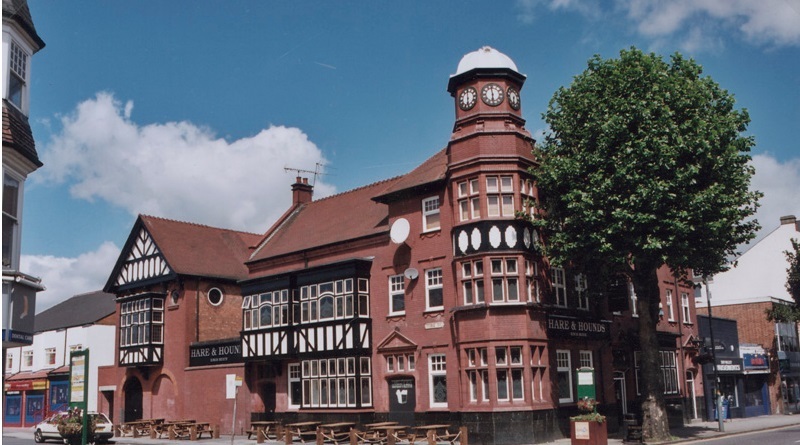 Moseley was named the ‘Best Urban Place to Live’ back in 2005 by the Sunday Times, which cited its ‘bohemian culture’ as one of the central reasons for its success. The Dark Horse stands out here as a multi-functional space; home to diners, drinkers, comedians, poets and club-goers. Often hosting club nights centred around dancehall and dub-reggae, but within the confines of a traditional-looking British pub, this is ideal for anyone trying to break out of their Broad Street comfort zone. Lab 11 is a warehouse venue dwarfed between the grand railway arches of Digbeth. Just around the corner from Birmingham’s well known Rainbow Venues, Lab 11 hosts a variety of EDM, House and Techno nights between it’s raw brick walls. I first visited Lab 11 for one of it’s ‘Magic Door’ events, held sporadically throughout the year. After being given a glittered stone upon entry (soon revealed to be a token for face paint), we entered into two rooms and a vast outside terrace that was home to spectacular jungle decorations as well as dancers dressed in everything from Gorilla onesies to Hawaiian shirts. Often playing host to internationally recognised DJs, Lab 11 is the perfect place to escape the monotony of the Broad Street cheese rooms. A night out at Suki10c is authentic. The building is a graffiti-covered property on Bordesley Street, Digbeth that could easily be mistaken as a deserted house overrun by vandals. In actual fact it is a close-quarters, 150-capacity club that has made a name for itself as a defining feature of Birmingham’s creative quarter. Perhaps best known as a live music venue, Suki10c has the natural atmosphere of a club and the intimate nights out that it hosts are always buzzing. Amongst them, ‘Twisted Thursdays’ features some of Birmingham’s best alternative DJs and MCs whilst Club L’Amour provides the perfect indie afterparty. A night out here is the perfect antithesis to the mass commerciality of Broad Street, with reasonably priced drinks and the most eclectic range of music that Birmingham has to offer. The Blackbox is the most unique of the Rainbow Venues. Providing an alternative to the large scale nights held at the Warehouse and Arena, the venue is – as you’d expect – a dark, box-like room. Low ceilings, shimmering lights and loud music provide an experience of immersion like no other. Often attracting the house and techno loyals, nights hosted at the Blackbox are scattered across certain Fridays and Saturdays, but the lack of a regular night only serves to make each one held here a real occasion. Digbeth has a reputation as being the alternative nucleus of Birmingham, with Rainbow being its exemplifying masterpiece. If you haven’t been already, this is a must. 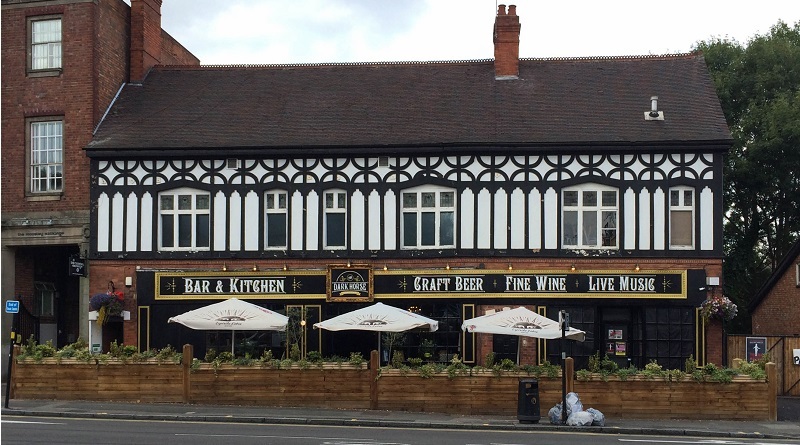 Hare and Hounds, like Moseley’s The Dark Horse, is a pub with an edge. Often hosting the best in new and up-coming bands and musicians, as well as some old veterans of the indie music scene, Hare and Hounds also manages to put on alternative and varied club nights that often run until two or three in the morning. The elevated rooms towards the back of the pub, accessible via some steps outside, have bars and a stage; putting on club nights that span jazz, indie, funk, hip-hop, reggae and much more. The building itself has been around since the 1820s, with it having stood in its current form since 1907. A lovely pub feel greets you at the entrance, with a bar, and good food being served all through the week whilst the two upstairs rooms host club nights and events nearly every evening of the week. Hare and Hounds really is an alternative hub of Birmingham and with such a wide variety of events there’s something a bit different to appeal to every Broad Street fanatic. VOID is the newest addition to this list of alternative nights out. Despite the venue being around for a little longer, the VOID Saturday nights have scarcely been running for a month. Advertised as an underground techno and house club night, VOID is set in a derelict monastery along Lower Trinity Street, Digbeth. Purposefully harking back to the raves of the early 90s, the focus at VOID is on the simple things; a cool space with great music, great lighting, and always a great crowd. With tickets only being £5 on the door and very affordable drink prices, this will really leave you wondering whether there’s ever any point returning to Broad Street to spend silly money on a single vodka mixer. 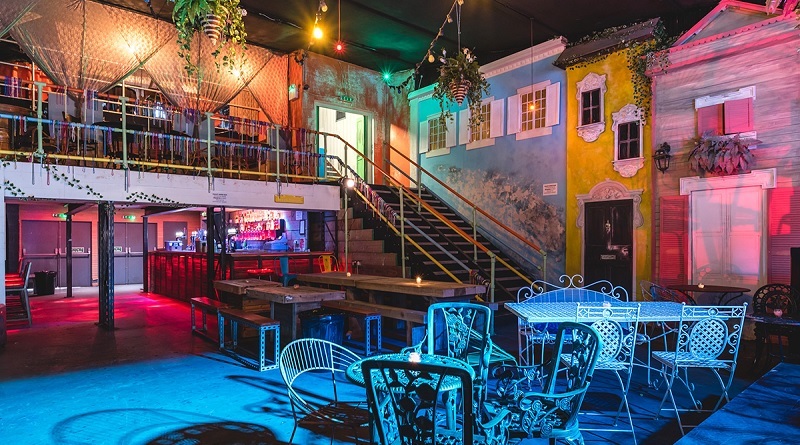 The newest addition to The Rainbow Venues, Mama Roux’s is another time machine carrying you back to western-era Deep South America and New Orleans. Hosting burlesque events in the evenings, and also being partly home to Digbeth Dining Club on Fridays, promoters have recently begun to see Mama Roux’s as the ideal venue to inject some class and originality into a night with a host of live music. 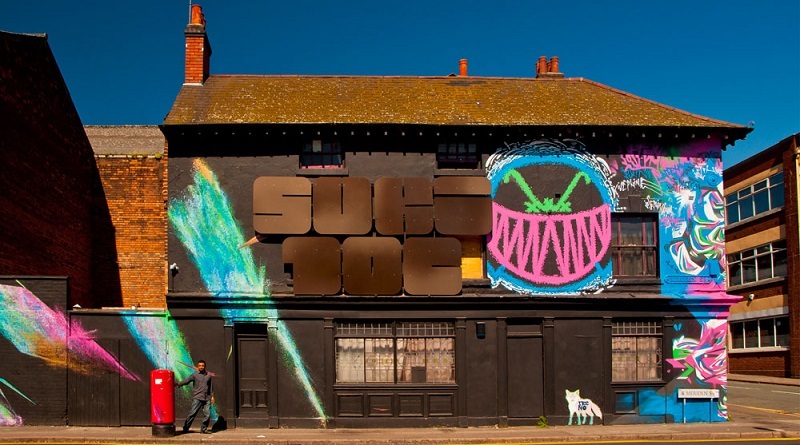 Having opened very recently, it’s worth paying a visit before Digbeth’s best kept secret becomes its most popular night out. Amusement 13 consistently put on busy and buzzing weekend nights, laying claim to hosting and attracting the best underground dance music in and around Birmingham at the moment. The 700-capacity venue spreads itself across a labyrinth of smaller rooms, each with their own individual feel. With some rooms decorated in graffiti scrawling and others boxed in between stone walls there’s an exciting DIY vibe to this venue, but on a large (and successful) scale. With events occurring across all nights of the week, including consistently popular Friday and Saturdays, there’s no excuse to not drag yourself away from your usual haunt and immerse yourself in the dance floor maze of Amusement 13. Standing out from many of the other venues mentioned above, Dares Bar is now the home of London’s popular 50s/60s night, All Shook Up, rather than the house and techno common amongst the alternative venues of Birmingham. With minimalist, modern industrial decor it transports this music into a setting that is both exciting and recognisable. The night itself is perfect for anyone yearning for a change who feels underground dance music isn’t for them. Keep an eye on their Facebook page for live music listings, too. Another venue worth checking out for it’s authentic decor and feel is The Night Owl. 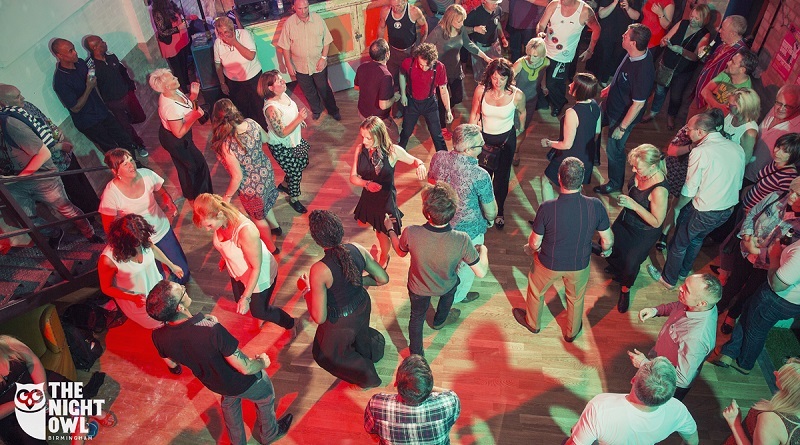 Hosting Northern Soul and Motown club nights as well as live bands, DJs and other 50s/60s themed nights, this place will transport you back to a time when alternative music was booming and no one was stood on a dance floor checking Instagram. There are also jamming and improvisation nights for any musicians wanting to have a good night out whilst improving their playing and getting to know some like-minded people. Having opened just over a year ago, The Night Owl is slowly making its own impression on Birmingham’s creative quarter and is a night out like no other.